When we gave it to my father-in-law tears were shed! We all miss Roly so it was an emotional moment. It was proudly hung on the living room wall there and then. You have done a fantastic job Sue. It is a real likeness of Roly and the attention to detail really shines through. You kept me up to date every step of the way and I really did appreciate your emails. It was amazing to see him come to life through your work. I most certainly will be recommending you Sue. Your work is fantastic and was a great alternative to the same gifts we gave dad year in, year out. I would say to anyone struggling to come up with a thoughtful and meaningful gift, then a trip to your webpage and a chat with you will certainly solve that dilemma. Your portraits are the perfect addition to the family home. 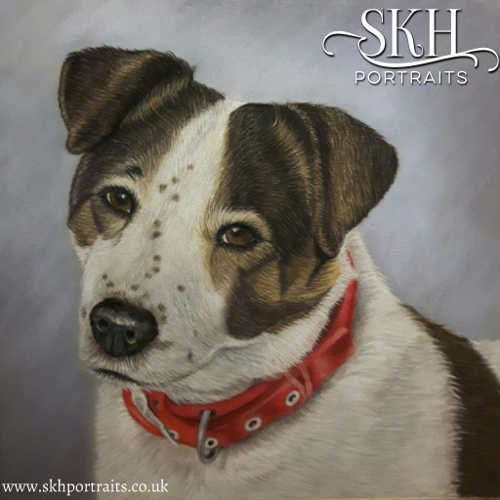 I’d just like to say thank you again from all of ‘The Orman family’ as we love our portrait of Roly and it will be enjoyed by all the family (not just dad) for many years to come. Thank you Sue.